About 20 students, some draped in flags from various nations, gathered at George Washington University’s (GWU’s) Kogan Plaza on Friday to support Ramie Abounaja, the GWU student forced to remove a Palestinian flag from his dorm room window in October. “We are showing our support for Ramie and showing our support for any student who feels like they don’t have the right to speak freely on campus,” said Vanessa Alarcon, one of the organizers of the Fly Your Flag event. Last week, GWU President Peter Knapp called Abounaja to personally apologize for the incident in which a campus police officer forced him to remove the flag, as well as for the reporting system that triggered the sending of a subsequent warning letter threatening disciplinary action. Knapp said he will end the “flawed process” of automatic warnings for reported policy violations and ensure consistent enforcement of university rules. 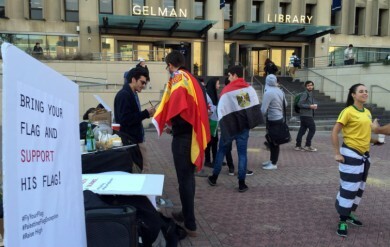 Another event organizer, Tarek Abdel Kouddous, said that while hanging flags from dorm windows is indeed a GWU fire code violation, Abounaja’s lawyers from the nonprofit Palestine Legal documented other types of flags being flown from other dormitories at the time Abounaja was asked to take his down, suggesting that the policy was being selectively enforced to punish pro-Palestinian views. Kouddous acknowledged that students have the right to their “intolerant views,” but that “the university’s mechanisms should not facilitate those views to be enforced on other students.” He said President Knapp’s apology “was a victory,” but not enough to address general intolerance against Palestinians on campus. Abounaja, for his part, smiled and posed for photographers with his flag at the event, even though he said media interest has been a bit overwhelming. Abounaja says the support he’s received from members of the GWU community has sparked his interest in becoming more active in fighting for causes he believes in. Long-time FIRE supporters may remember our involvement in other campus flag controversies over the years. As far back as 2003, University of Alabama students in the midst of a similar dorm-room flag controversy wore and waved flags to protest the school’s policy. (The university abandoned the policy to ban all window displays after FIRE intervened.) And more recently, in 2013, FIRE wrote to Ball State University after it misapplied a policy on “expressive activity” and insisted a professor remove an Italian flag from his office. Ball State allowed him to re-post the flag and vowed to reevaluate its policy.